Because the sun did not appear, I moved to slope, and then it showed up from a break in the clouds at 5:54. The sun light slightly turned red. I slowly looked down to the sea of trees. Yellow leaves were still stuck to birch around this area, but the high place of the tree didn’t have blades anymore. The red rowan and the broadleaf tree stood straight in the checker trees. Soon the night suspension of traffic will be started because the street in Shiretoko Pass may be freeze in a few days. After that it becomes impossible to go seeing sunrise there. 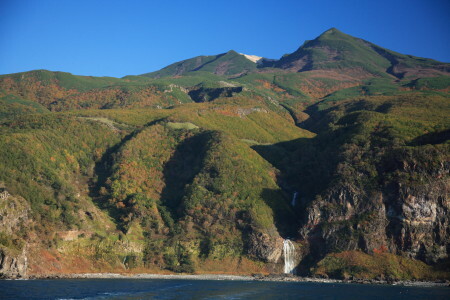 So this is a precious moment of short autumn in Shiretoko Pass. 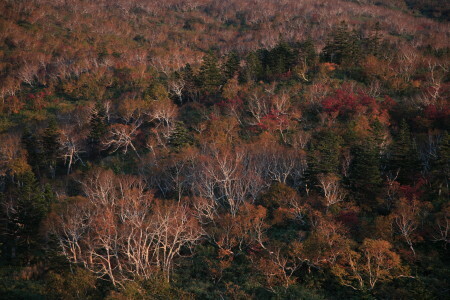 I returned to the Utoro City while enjoying a flock of deer and progress of colored leaves. Undulation remained in the sea and the excursion ship to watch Shiretoko from the sea was canceled this morning. I rescheduled after breakfast, and decided to go to the forest close to Uroto. I traced a boar’s passage. The forest was bright by colored and fallen leaves. When I came the same place last summer, the forest was thick. There were a lot of big acorns under the Quercus crispula tree. It is said it’s a good harvest this year. 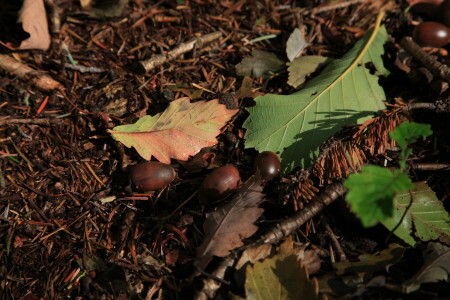 An acorn is a precious food for bears going to hibernation. I found something that a bear dropped. Woops! It’s still soft! A lot of people think that bear is a carnivorous animal which attacks human beings, though 80% of their food is plants. It is annoying belief for bears. To tell the truth, I saw eight bears in total this time, but they are very big and shy animal in the forest. I think this is the only place in Japan where you can imagine a bear watching you from somewhere in the forest. You will have a valuable experience here. However, there are some rules you need to follow. For example, when you come to the forest, you should let bears know that you are in the forest, and avoid meeting bears. It is very important to know bear’s ecology. Please enter a forest with a person who knows well about a bear. 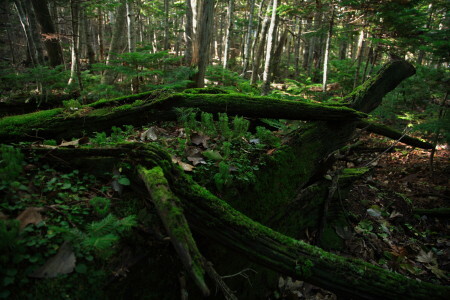 I stepped on forest floor fallen leaves and breathed by the fallen tree covered with moss. When did this tree fall down? Several baby firs have already grown on the fallen tree. This is the spot of fallen tree update. 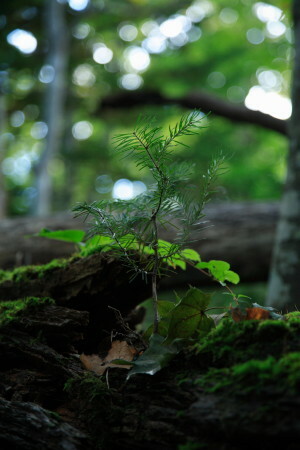 It is only a part of a cycle of a forest in dozens of years. Yes, there is time existence in the human world and the forest of Shiretoko. In the afternoon I got in an excursion ship around a shoreline from the Utoro port. There are two types of excursion ships. One is a big tour boat and the other is a small cabin cruiser. I recommend a cruiser type from Godzilla Rock sightseeing company. They know the key point of Shiretoko and will show you a curious stone, a waterfall and a bear. They even have a sea route called a bear watching ship. The route was canceled this time, so I had to reserve different cruise, which was terrible like when you pull a lose lottery. They couldn’t take us to see a curious stone and a waterfall because of the stormy sea. Because a mast of a ship or a wire was in a camera finder, I was not able to take most of the photographs. There was no space to move in the deck. One hour later, I came back to land without any satisfaction. Oh, and you need gloves and a hat even in summer time when you take a ship. Plus, a jacket which does not let wind go through. I restarted finding the place to take photograph of sunset. 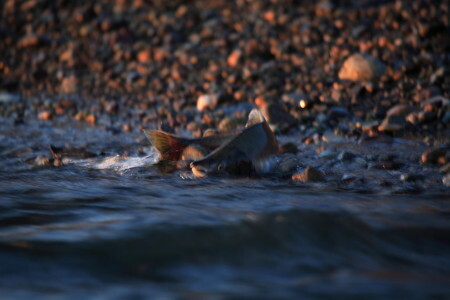 While I was waiting for the sunset, I started taking photos of salmon in the Horobetsu River, an entrance of the world natural heritage. Salmons gathered in the river mouth, and some of them left to shallows when the wave was coming back and forth. The I released the shutter. I saw the last vitality into their eyes. Hotchare (salmon’s corpse) which already finished laying eggs inclined on the beach… The red sunset begun to set in the sea of Okhotsk. I think there is no more words needed, it was a dramatic sunset.